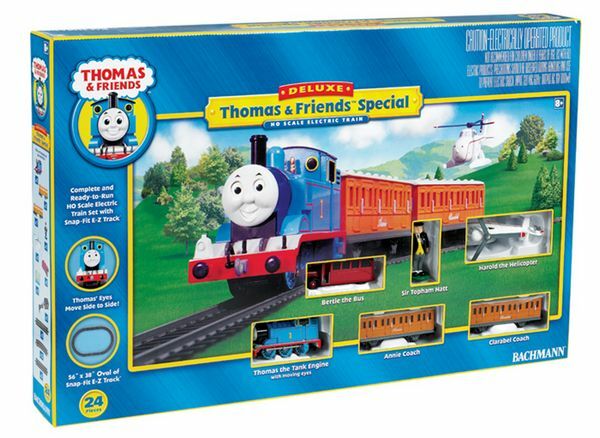 An authentic Thomas & Friends® train set with a 56" x 38" oval layout of E-Z Track® with black roadbed (rail joiners provided). Quick and easy snap-together track assembly. No nail, screws or special tools needed. Thomas the Tank Engine with moving eyes. His eyes move from side to side as he travels down the track. Annie and Clarabel coaches with international style hook and loop couplers (the hook and loop couplers will engage automatically when cars are gently pushed together). Sir Topham Hatt is molded to a base and accurately painted. Thomas, Annie, Clarabel, Bertie, and Herald are accurately painted and decorated. COMMENTS: To ensure trouble-free operation, use only Bachmann's patented E-Z Track® products with this set. Use of non-compatible systems may result in unsatisfactory performance. BOX DIMENSIONS: 17.75" W. X 3.25" H. X 27.88" L.